Ahmedabad, February 16: Traders in Gujarat's Ahmedabad have called for a one-day bandh against the dastardly attack on CRPF soldiers in Jammu & Kashmir's Pulwama district in Awantipora. According to reports, the various trade associations decided to observe a bandh on Saturday to peacefully register their protest against the terror attack on CRPF jawans. List of Jawans Martyred in Pulwama Attack: Names and Photos of 40 CRPF Bravehearts Martyred in JeM Terror Strike in J&K. Foot market, Dhalgarwad Bazaar and Lal Darwaza markets will be closed today as part of the peaceful protest, said reports. Pulwama Terror Attack: All Party Meeting in Parliament Library at 11 AM Today. Earlier, a message was going viral on social media in Rajasthan on Friday with an appeal of ‘Bharat Bandh’ on Saturday. After the message went viral on WhatsApp and Facebook, Gopal ji’s Rashta Vyapar Mandal (Samiti) in Jaipur appealed to the people to observe a nationwide strike for a day to pay tribute to the bravehearts who sacrificed their lives to secure the country. Also, the organisation decided to close the business till 1 pm on Friday in Jaipur. 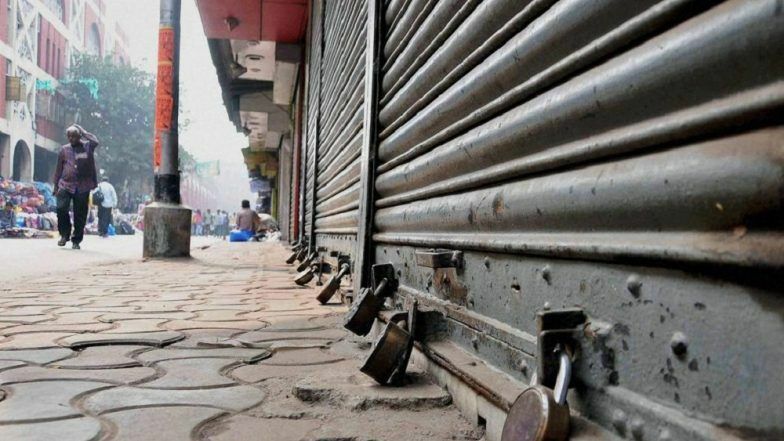 Pulwama Terror Attack: Message to Observe Bharat Bandh to Pay Tribute to CRPF Martyrs Goes Viral, Trader Association Calls Complete Shutdown in Jaipur.